If I’ve learned anything from Star Trek, it’s that when the words “spacetime” and “rip apart” occur in the same sentience, you get the heck out of the solar system at warp 9. Yet, having failed to blow up the planet with the LHC, particle physicists (being the crazy, zany, and occasionally maniacal people that they are) are at it once again. This time, they want to rip a hole in spacetime. 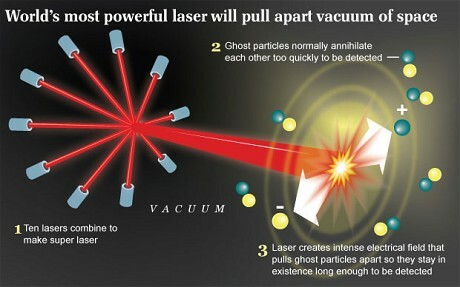 The combined power of 10 separate lasers would be focused down to a very small volume, creating conditions more extreme than in the center of our sun. It is hoped (yes, hoped) that this immense energy will punch a hole through the fabric of spacetime itself, heralding a new era of exotic physics discovery. But however things turn out, they had better have a physicist on team named Gordon Freedman to help stop the inevitable alien incursion, or better yet, Buckaroo Banzai (because didn’t he try this already? ).